The caramel appletini is a delicious cocktail that holds sweet flavors of the fall season in a captivating green vodka martini. It's perfect for any autumn party, absolutely delicious on its own, and pairs beautifully with homemade caramel apples. You're going to love how easy this sweet cocktail is to mix up. You only need two ingredients, a cocktail shaker, some ice, and a frosty martini glass! The recipe features UV Green Apple Vodka, that brilliant green-colored vodka with the sweet taste of apples that is on nearly every liquor shelf and very affordable. The caramel flavoring comes from butterscotch schnapps, another staple in the modern bar. When these two spirits come together, you're left with a cocktail that can only be described as yummy. It's a fun one to share with friends or mix up for yourself whenever you get a craving for a drink that's delectably sweet and fruity. In a cocktail shaker filled with ice, pour the vodka and butterscotch schnapps. Garnish with a caramel and green apple slice if desired. 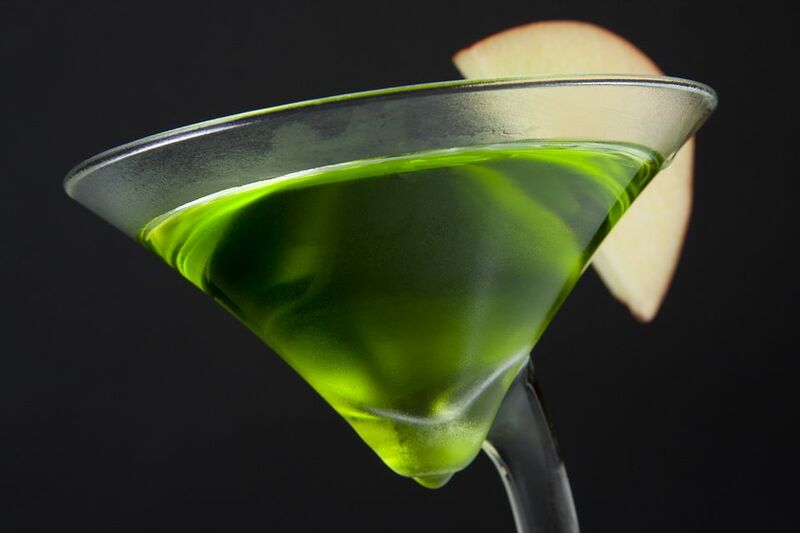 For the apple slice, green apples are preferred in UV Vodka's original recipe. If you only have a red apple, it will look just as nice and bring a little visual contrast to the drink. Either way, dip the slices in lemon juice immediately after cutting them. If you don't, the white flesh will begin to turn brown within minutes due to oxidation. Cut a small slit in each slice so it can easily be slipped onto the rim of your glass. A piece of soft caramel candy is a fun treat to go along with this drink. It's not easy to add to the glass rim, though, so you'll have to get creative. A quick option is to stab the candy with a cocktail skewer and place it at the bottom of the glass. The drinker can then pull it out and eat the candy whenever they like. Another garnish option is to cut a full apple slice that will float on top of the drink. You can rest the caramel candy on top of this to create a mini boat. You can also drizzle a little caramel ice cream topping over the apple or in the glass before pouring the drink. Just be sure to keep it inside the glass or you'll have a sticky mess. Caramel and toffee apple martinis are very popular and there are other recipes that combine the same sweet flavors. If you have a clear apple vodka, you can get the same green color by pouring a sour apple schnapps like Apple Pucker. Simple shake up 1 1/2 ounces apple vodka and 1 ounce each of apple and butterscotch schnapps. For a similar drink, switch to tequila, let apple cider take over the fruitiness, and mix up a caramel apple pie cocktail. How Strong Is a Caramel Appletini? With only two liquors and no mixers in this martini, you can expect it to be pretty potent. However, the vodka is just 60 proof (not 80 proof, like most) and most butterscotch schnapps are bottled at 30 proof, so the martini is lighter than you might expect. It will shake up to just 21 percent ABV (42 proof). That's about average for fruity martinis, but do be aware that the sweet taste can trick you into drinking more and they add up quickly!